The Summer Specials won't be out for a few days yet but you can already pre-order the Christmas annuals! 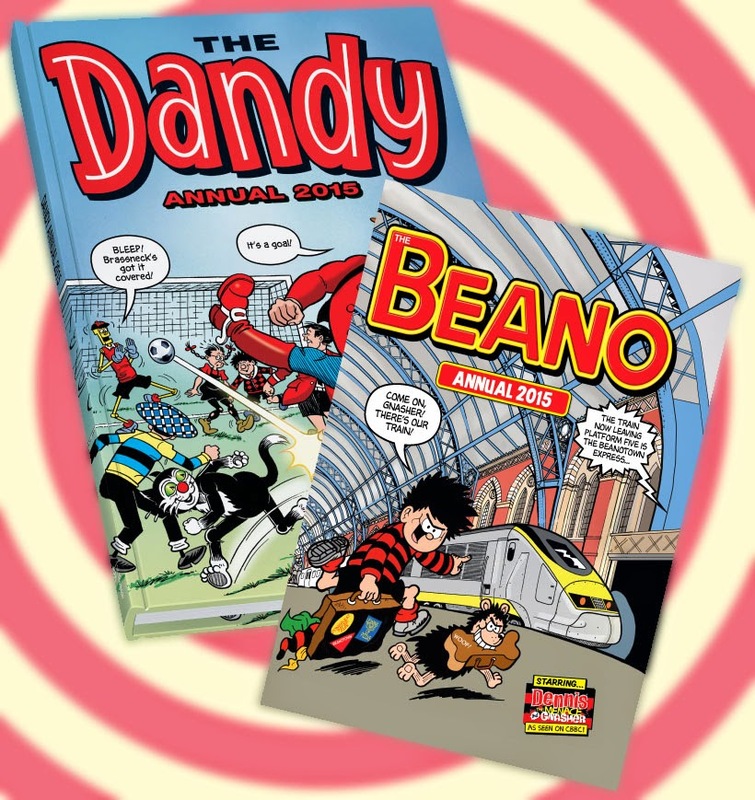 The Dandy Annual 2015 and The Beano Annual 2015 are both available to order separately at £5.99 each from the publishers at the DC Thomson Shop, or you can save money if you order them as a double pack for only £10. According to the website they'll be delivered the first week of August. 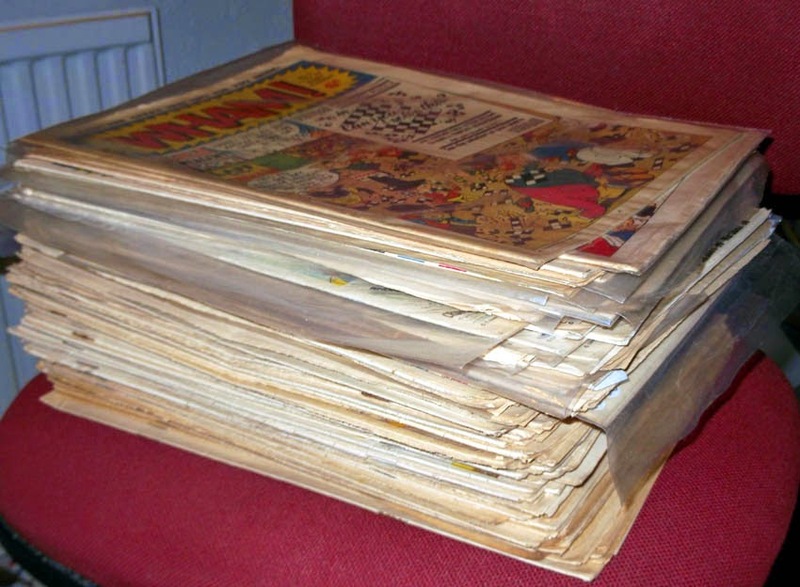 Speaking of annuals, I'd better get on with drawing the pages for the 2016 editions! 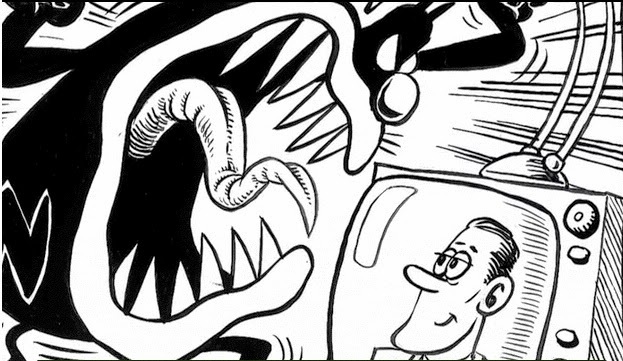 There's only a few days to go to help Hunt Emerson reach his Kickstarter target to publish a new collected edition of his brilliant Calculus Cat comic strips. The required amount of £10,000 is almost there, but not quite! It'd be a shame for the project to fall short. 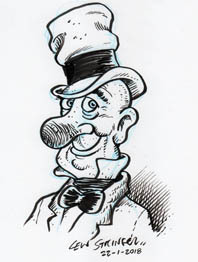 After all, this is Hunt Emerson, - a cartoon genius who has been entertaining us with his work for around 40 years! 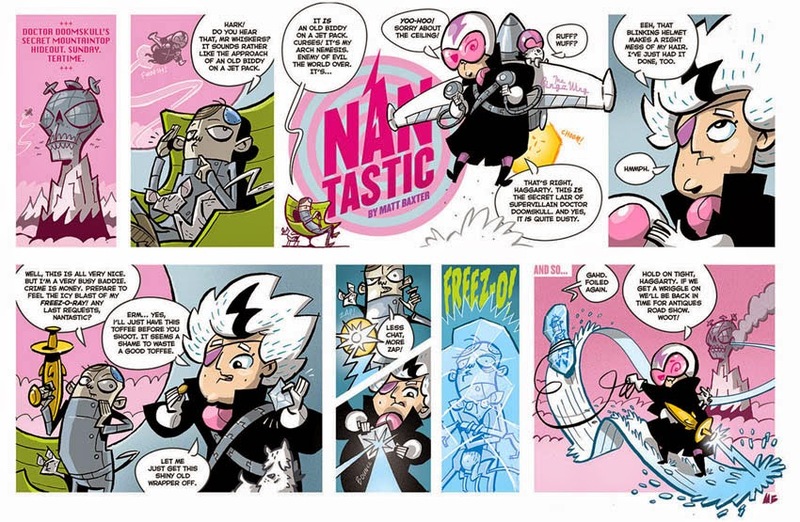 As well as the existing Calculus Cat strips, there's also stuff that has never been printed before, plus extra guest pages by various artists. (Including me, but don't let that put you off.) So let's get behind this project and make the book become a reality. Remember, no one will be charged if the project doesn't meet its goal, and if it does reach its target you'll only have a few months to wait before the book is published, so you can't lose! UPDATE 30/6/2014: I'm pleased to see that Hunt has reached his target so the book will definitely be published! When I posted about the 2000AD Sci-Fi Special making it's comeback last month there was some other news I couldn't reveal at the time. 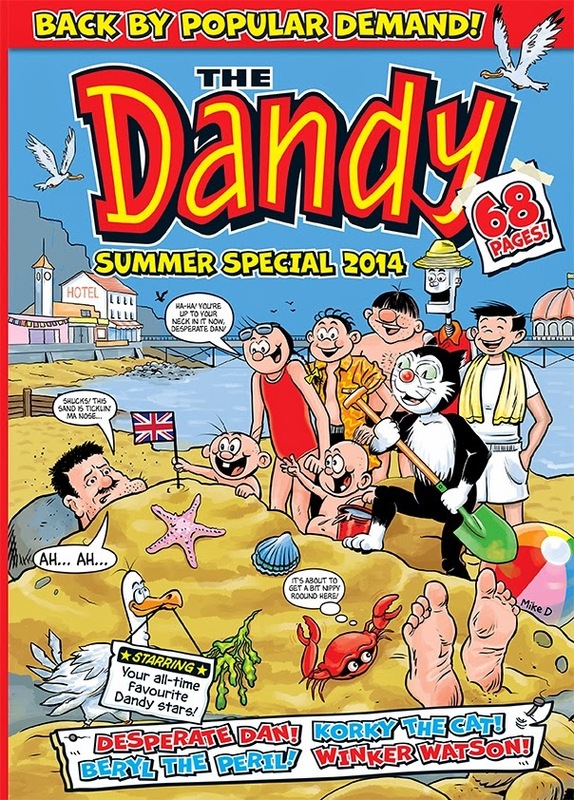 Today, DC Thomson have released the news so I guess it's ok to mention that there will also be Summer Specials for both The Dandy and The Beano. 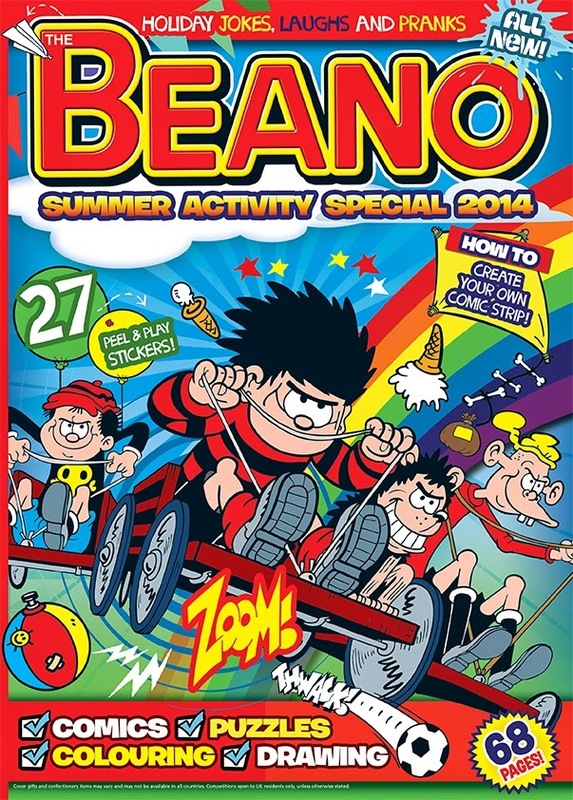 The Beano Summer Activity Special also has 68 pages, but filled with all-new content. 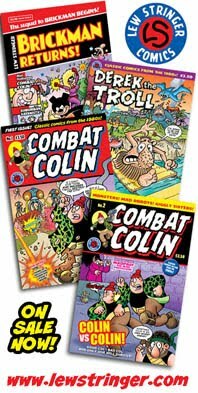 Strips will focus on the core Beano characters (Dennis, Minnie, Roger, etc), plus there'll be lots of activity/puzzle pages and free stickers. I have a couple of items on eBay this week that I hope may interest some of you. 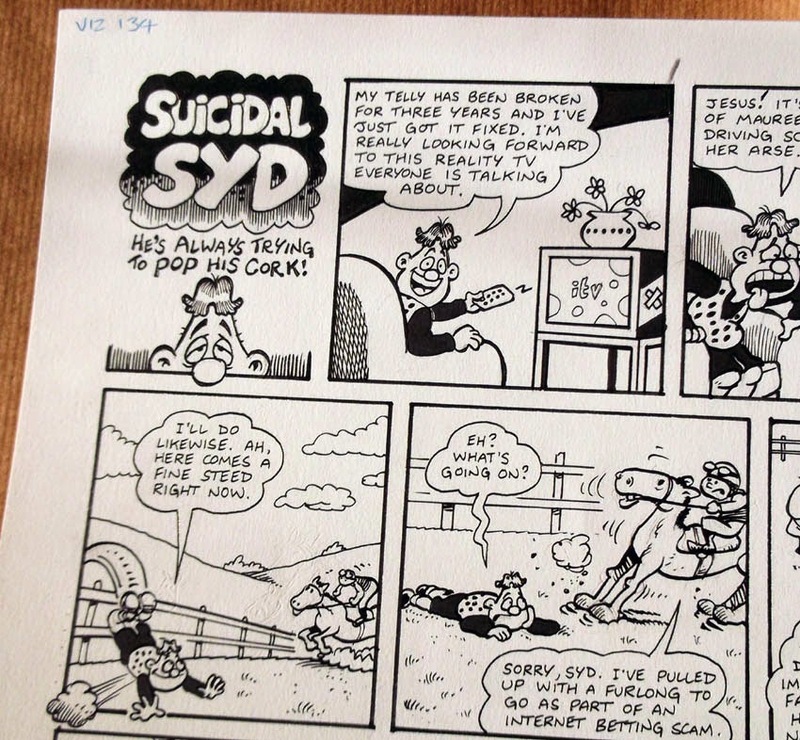 Firstly, there's a page of original Viz artwork in the form of a complete Suicidal Syd story I did a few years ago. Back ink on Bristol Board. Visit my eBay site (at this link) to see more photos of the page. The other thing I'm selling isn't comic related, but is a piece of my childhood. An Action Man figure I had for Christmas 1970. 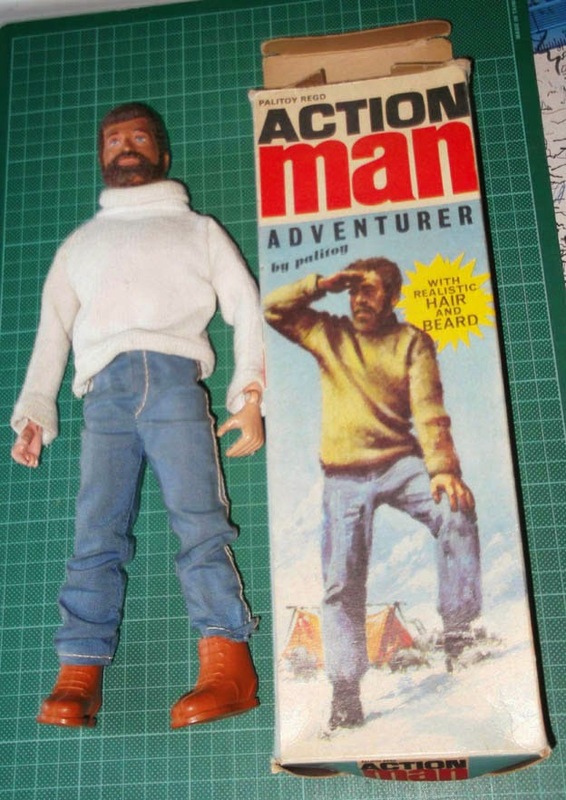 The first bearded Action Man! Complete and in its box, plus Equipment Manual. You can see that with more photos if you click this link. Both auctions end on Sunday evening. All bids very welcome! Thanks for looking. 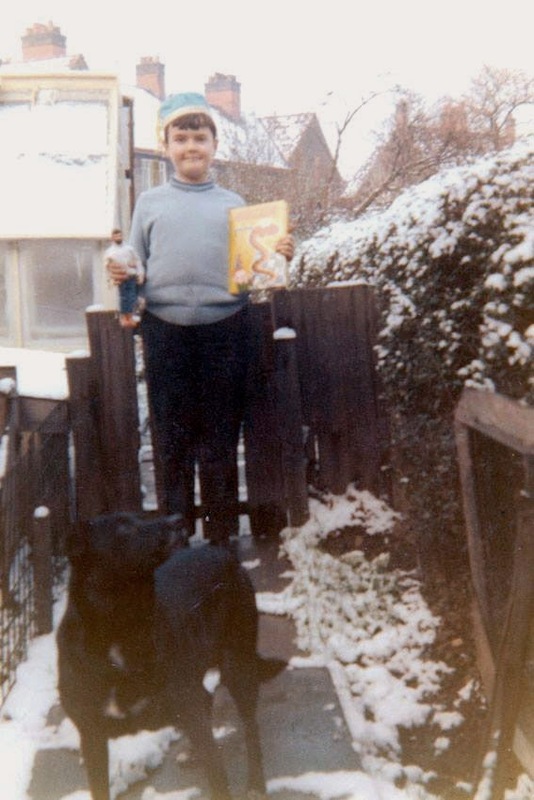 Below: That's me, Christmas 1970, with two of my presents for that year. The very Action Man I'm now selling, plus the first Whizzer and Chips Annual (which isn't for sale). My dog Judy (1963 to 1978) is in the foreground. Bear Alley Books' new publication Countdown to TV Action is due to be published in just over a week's time on July 4th 2014. 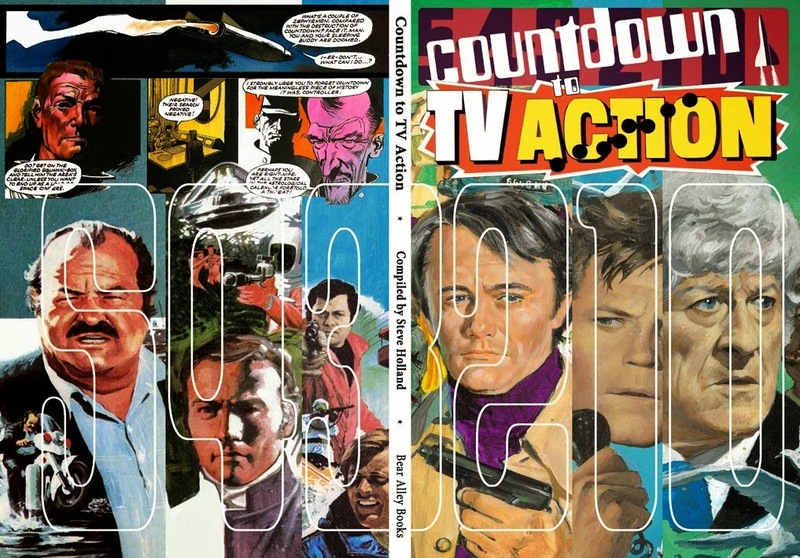 The 200 page book covers the history of the fondly remembered 1970s comic Countdown (which became TV Action with its 59th issue), and will also include an index of all the strips. One I'm definitely looking forward to, and I'm sure I'm not alone in that! 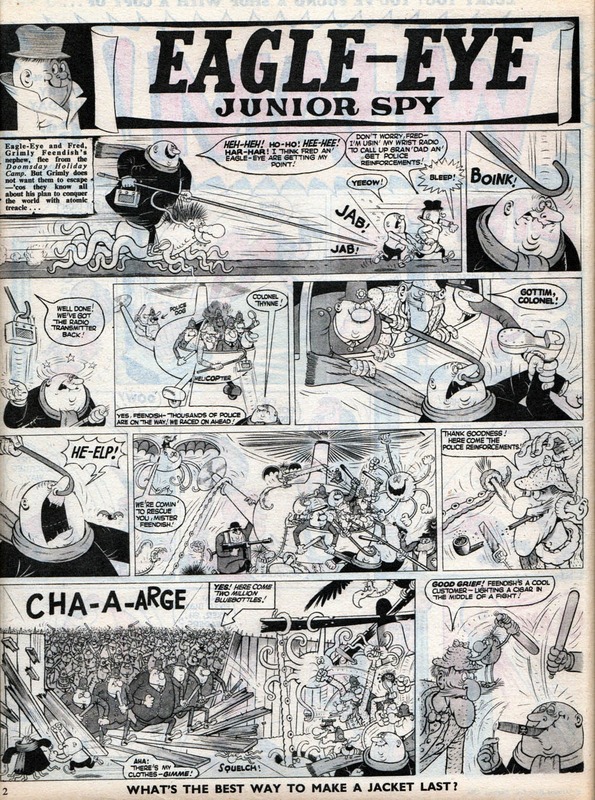 In early summer 1990, Fleetway released the Classic Action Holiday Special, a 52 page one-off reviving several of their old characters in brand new stories. It's a bit of an oddity because although the comic is obviously partly targeted at readers who would remember those heroes from Valiant, Buster, Tiger, and Lion (readers who would be adults by 1990) the stories themselves are written for children. In most instances, children a bit younger than the audience the characters were originally aimed at. The end results are stories that feel too simplistic for the nostalgic crowd whilst being perhaps too old fashioned for kids of the 1990s. 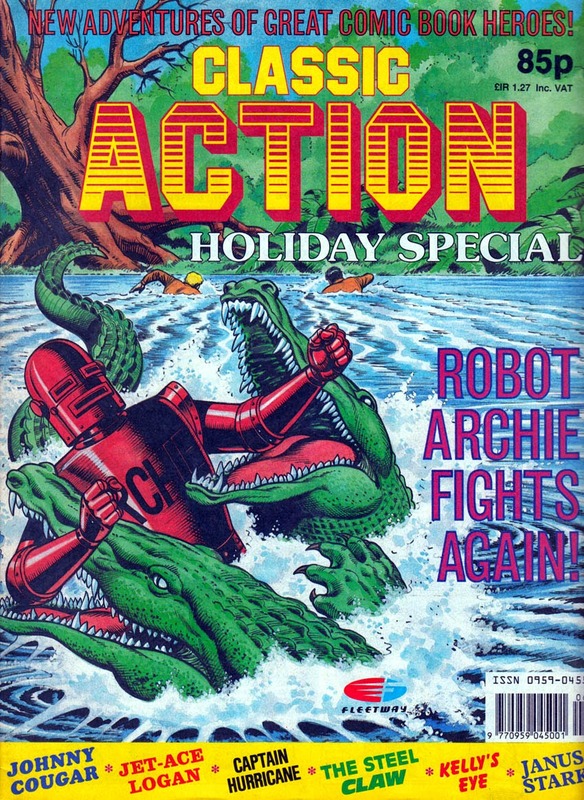 Then onto a four page full colour Robot Archie story drawn by Sandy James. 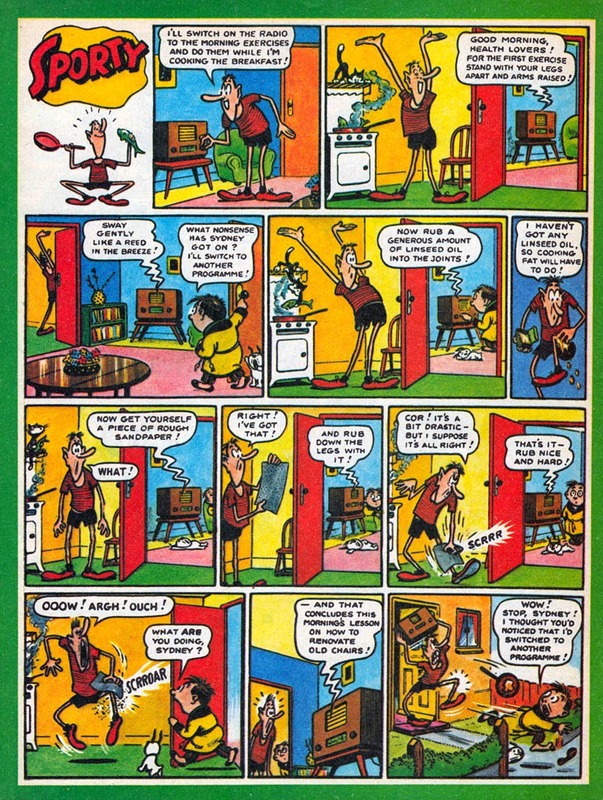 Curiously, Archie was back to his original silent self (as he was in the 1950s) which was a shame as the vocal Archie of the 1960s/70s had been quite amusing. Next, a four page Steel Claw story. Eduardo Vano Ibarra (Vanyo) is the artist here I think. (None of the strips are credited.) 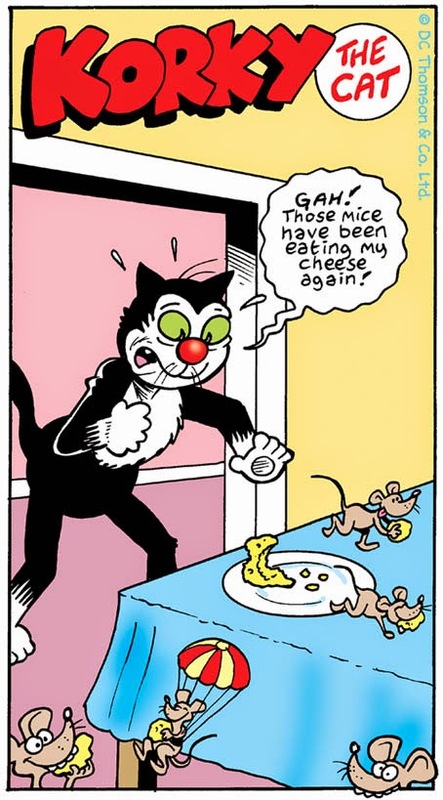 By 1990, and their audience getting younger, publishers were nervous about showing certain scenes in comics in the fear of kids imitating them. 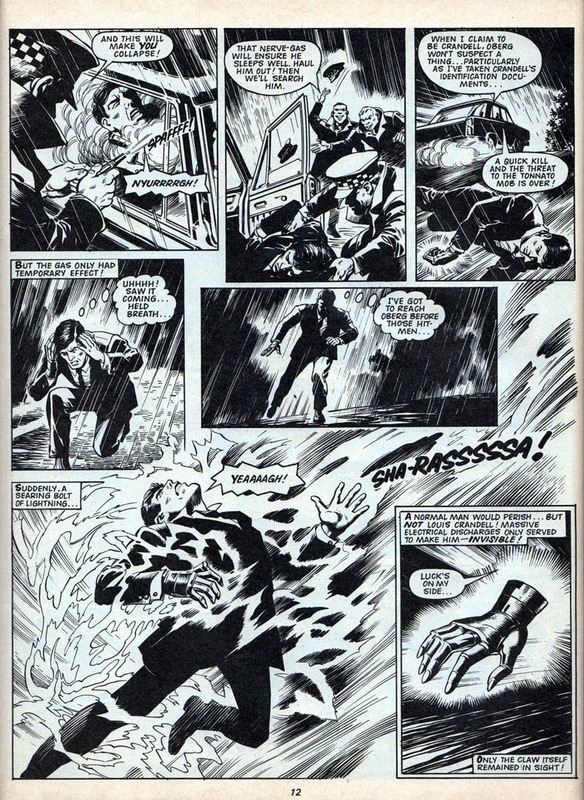 In the 1960's, when Fleetway granted its readers with more sense, Louis Crandell was often shown shoving the fingers of his Steel Claw into light sockets or grabbing live wires to activate his invisibility. This presented a problem for the revival of the strip. The solution? Have Crandell suddenly struck by lightning! Stretching credibility even for this strip, but the idea being that kids couldn't imitate an act of nature. 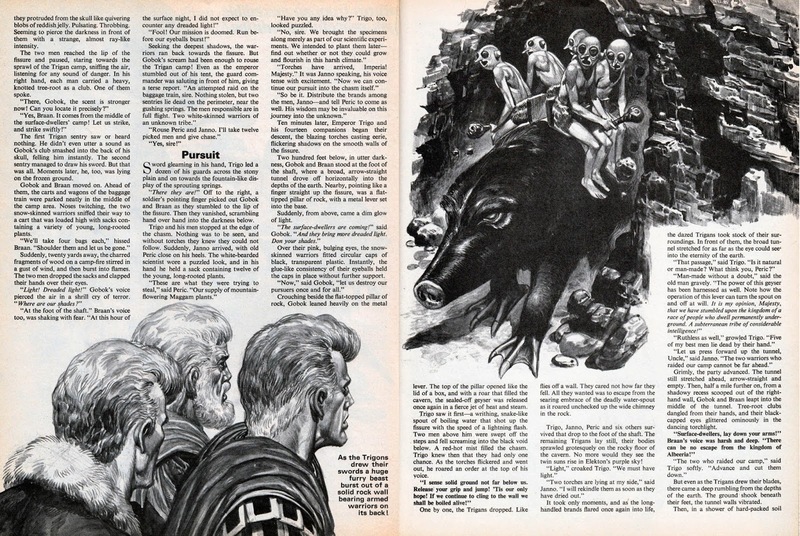 A six page Janus Stark story followed. Not sure who the artist is. There were also a few reprint features and a couple of Norman Mansbridge Autograph Albert funnies in the special. Overall, an interesting package despite my reservations about the scripts, and worth hunting down if you were a fan of those classic characters. Wham! No.3, the earliest one in my collection. 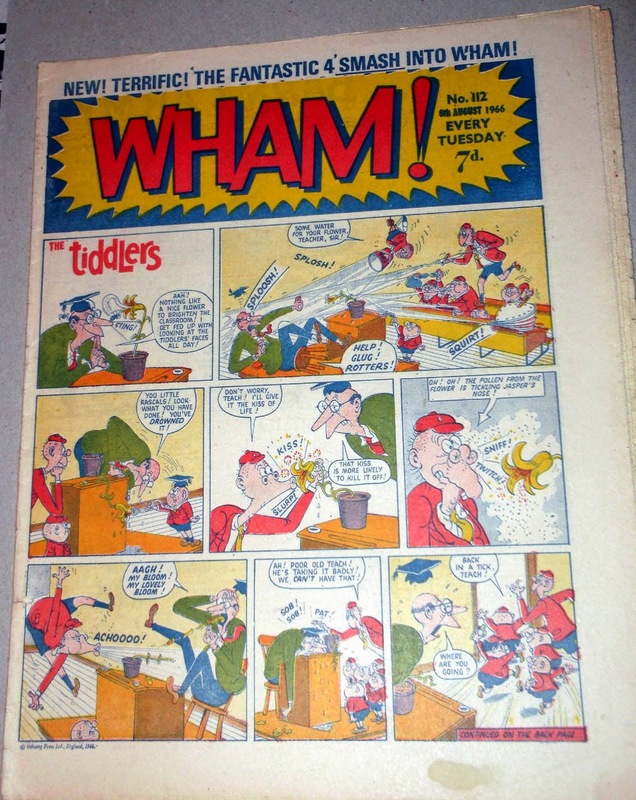 Thanks to George Shiers on his Wacky Comics blog for the reminder that it's been 50 years this week since Wham! No.1 was in the shops. Although cover dated the weekend of June 20th, the actual on-sale day would have been the 16th, or probably the 15th June 1964. I didn't discover Wham! 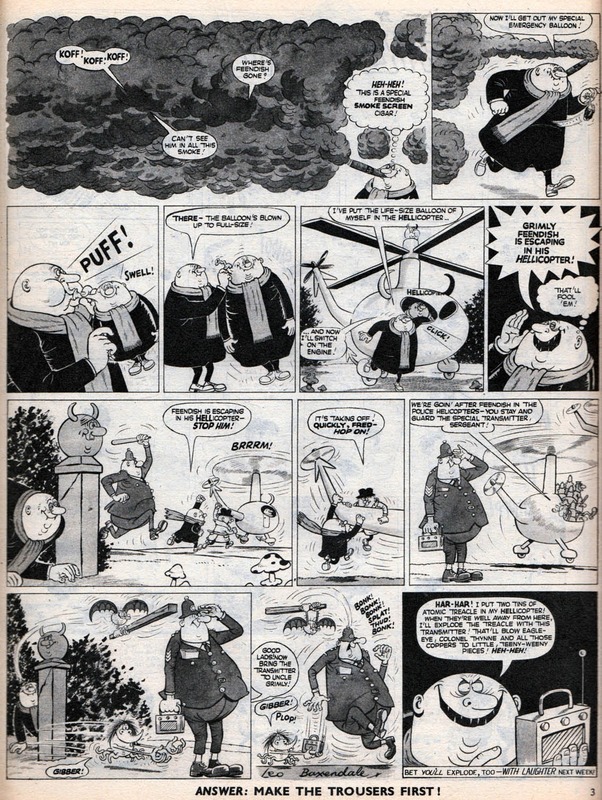 until issue 77, dated 4th December 1965, so it had been around quite a while before then. Once I read that issue though I was hooked! 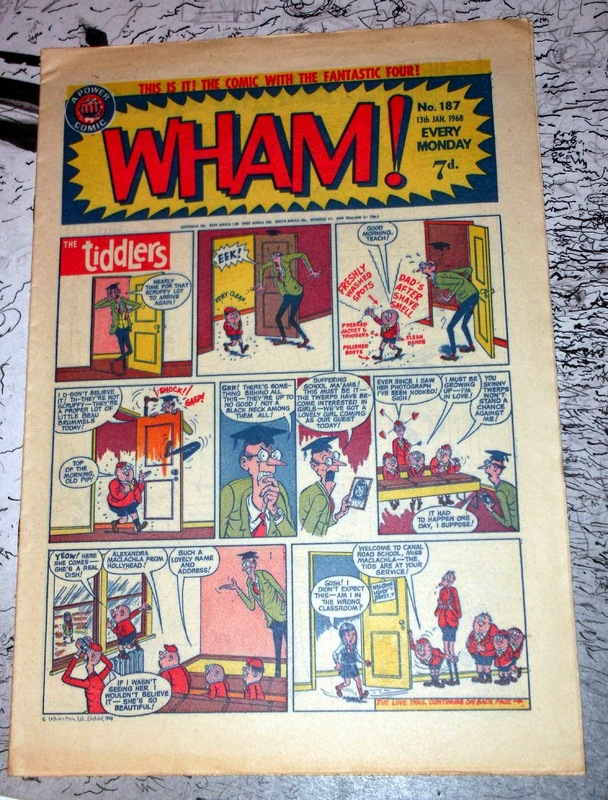 I liked Dandy and Beano, but their new rival Wham! was wilder, dafter, and more unpredictable. Following The Hulk's debut in Wham's sister comic Smash! 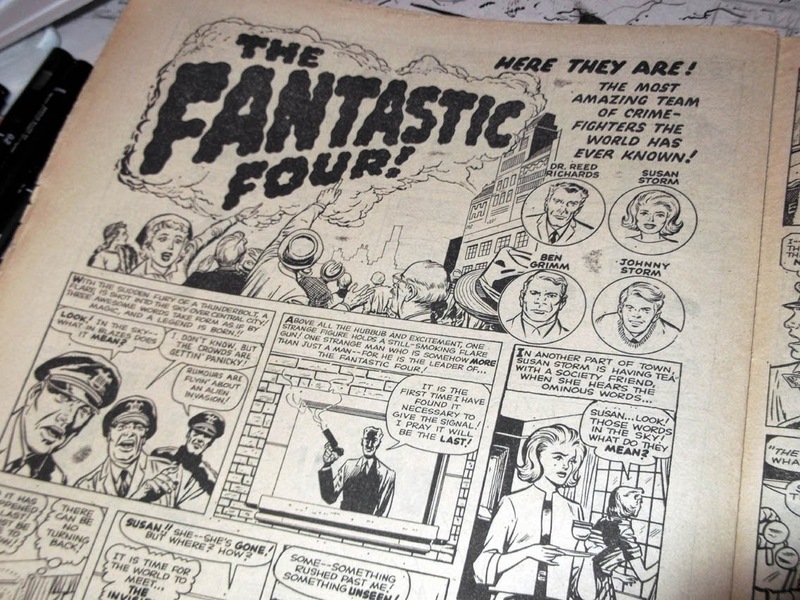 in May 1966, The Fantastic Four followed in Wham! No.112 (6th August 1966). 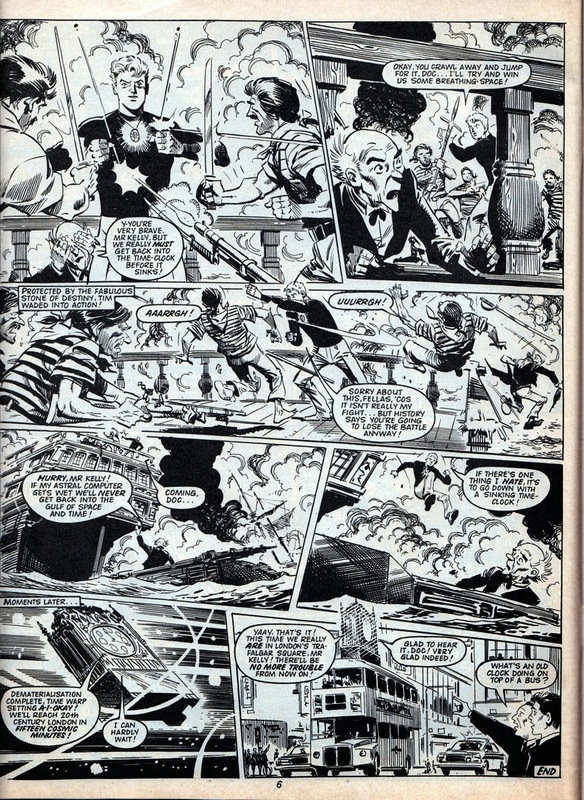 It's debatable whether these Marvel reprints were a benefit to Wham! 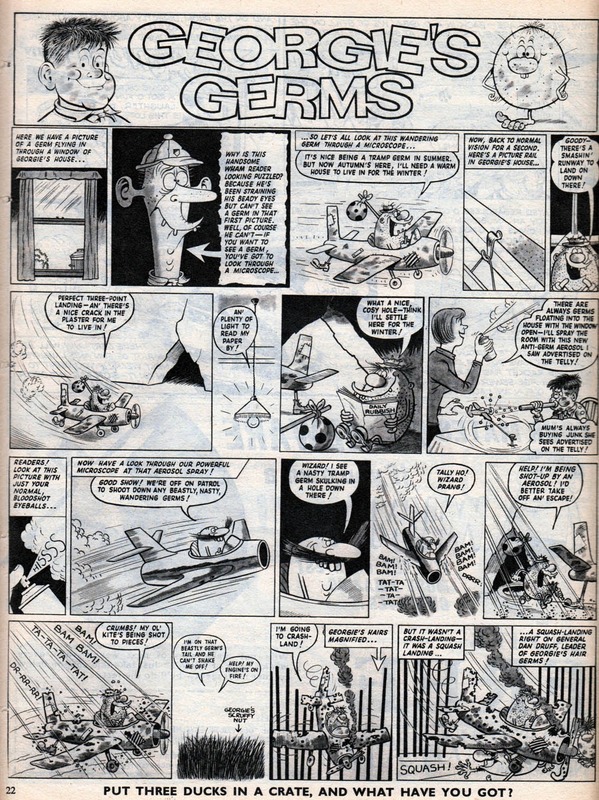 as they elbowed out a few original strips, but it gave the comic more variety at least, and introduced many of us to the FF. 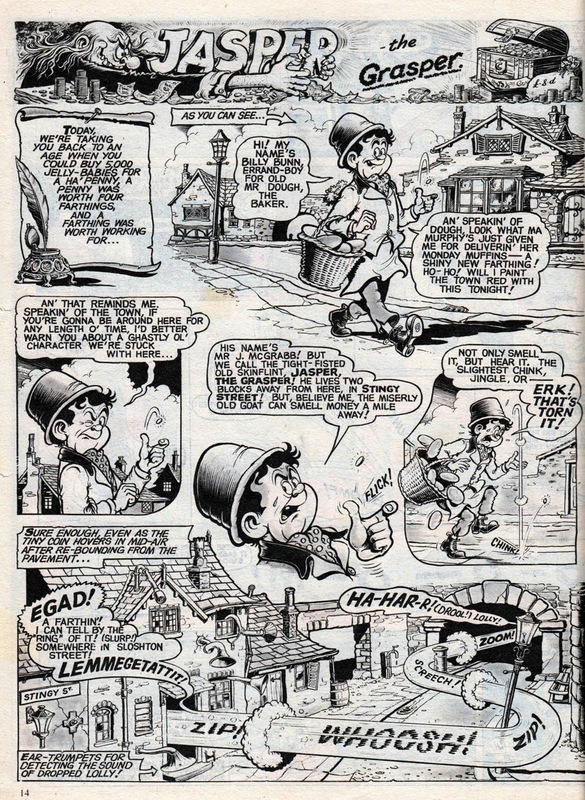 1966 also saw Leo Baxendale depart Odhams, which weakened Wham! somewhat but it still retained a lively anarchic flavour. 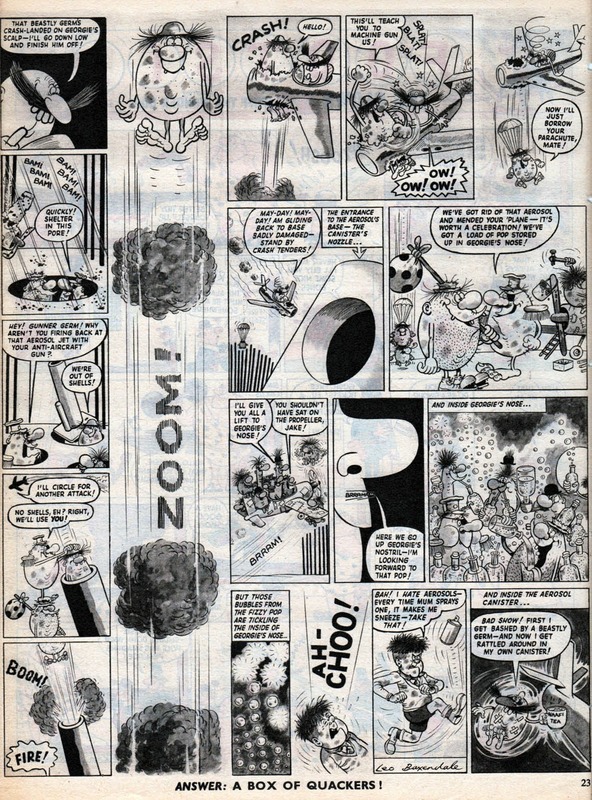 Artists such as Mike Lacey (on The Tiddlers, shown here) did a solid job of imitating Baxendale's 1960s style. 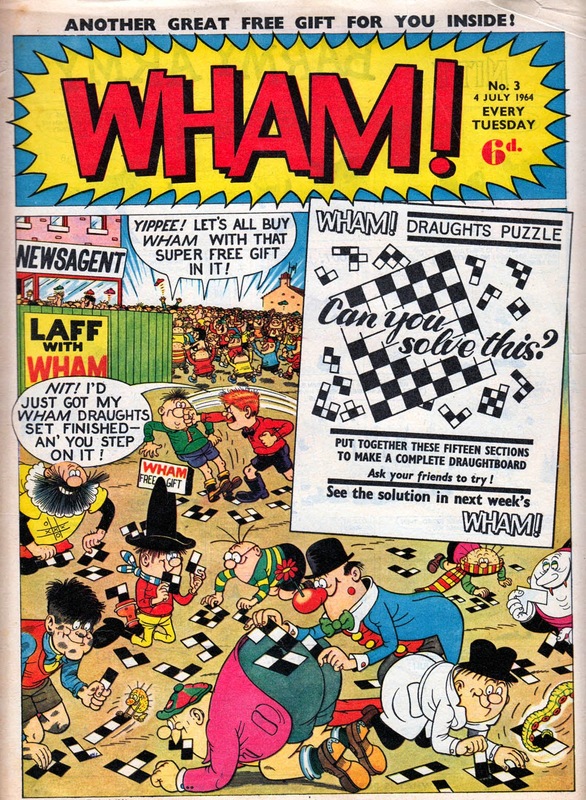 Sadly, the early days of 1968 saw the final issue of Wham! 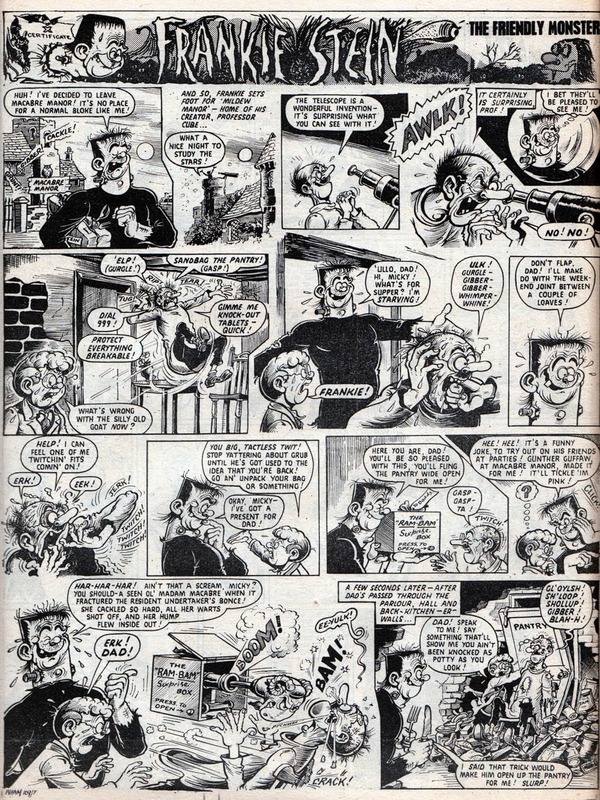 (No.187, 13th January 1968) as it announced a merger with relative newcomer Pow! for the following week. 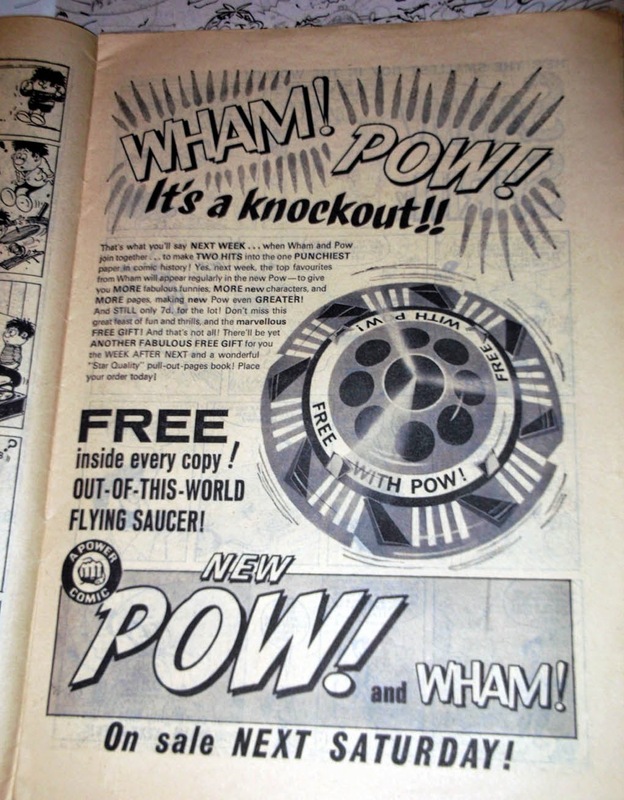 Still, Wham's three and a half year run can't be sniffed at, and it remains a memorable part of the sixties comics scene for those of us who were lucky enough to be children during that decade. Happy 50th, Wham! and thanks for the lunacy. All scans taken from my collection of Wham! comics. Over the years I've managed to buy most of them, but there are still gaps. However, at my age I'm no longer inclined to track down the missing issues. The stack I have here is perfectly adequate for when I get around to re-reading them all again. Whenever that will be! You'll find several older posts I wrote about Wham! if you type the relevant keywords into the search window at the top left of this blog. 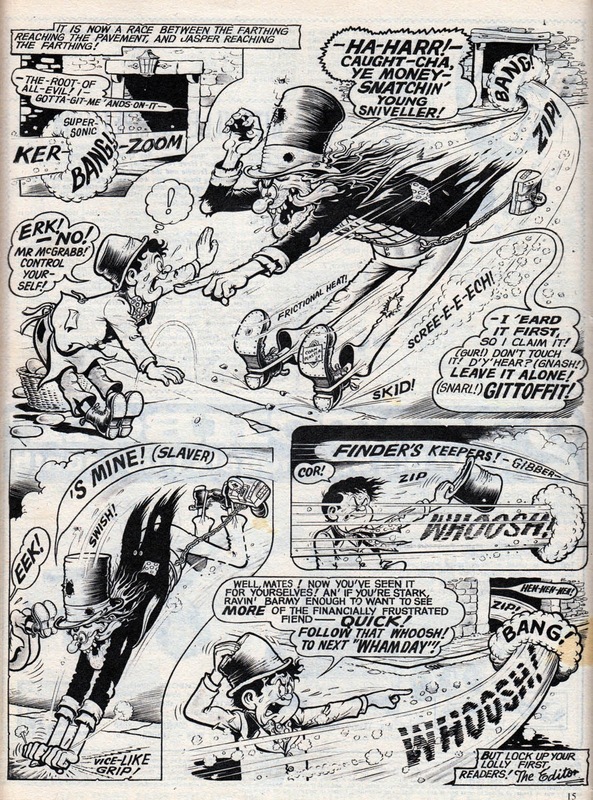 Jamie Smart has been a full time comic artist for around 15 years now, revamping Desperate Dan for The Dandy and Roger the Dodger for The Beano as well as creating his own characters such as Looshkin for The Phoenix. 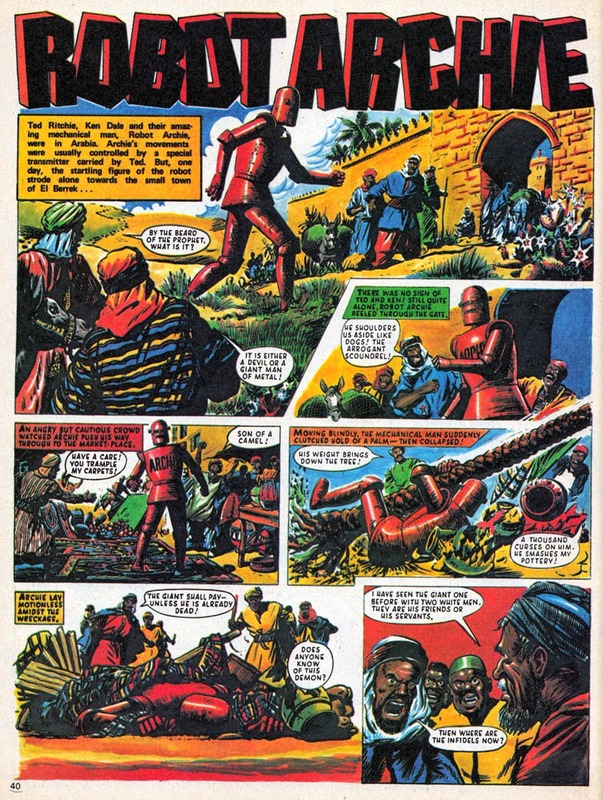 His modern style has been controversial at times, or as Richard Bruton on the Forbidden Planet Blog put it: "a revamp of Desperate Dan for the Dandy that really annoyed the purists and delighted those not living in 1950". Whatever one's views on Jamie's style it can't be denied that his artwork is distinctive and one can admire the fact that he's done things his own way instead of ghosting the styles of the past. Over the past several months Jamie has, in the words of Tony Stark of Iron Man fame, been "putting a team together". 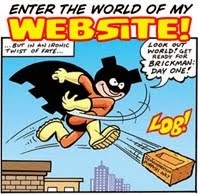 The work of that team of comic creators old and new is now about to appear in a brand new digital humour title, - Moose Kid Comics, packed with all new characters, - and it's free! BRAND NEW MOOSE KID COMICS DIGITAL TITLE LAUNCHES! An intrepid team of comic creators have just launched Moose Kid Comics – a free, brand new digital comic that aims to be a showcase for talent and stories they feel will help make both British and international children’s comics great again. 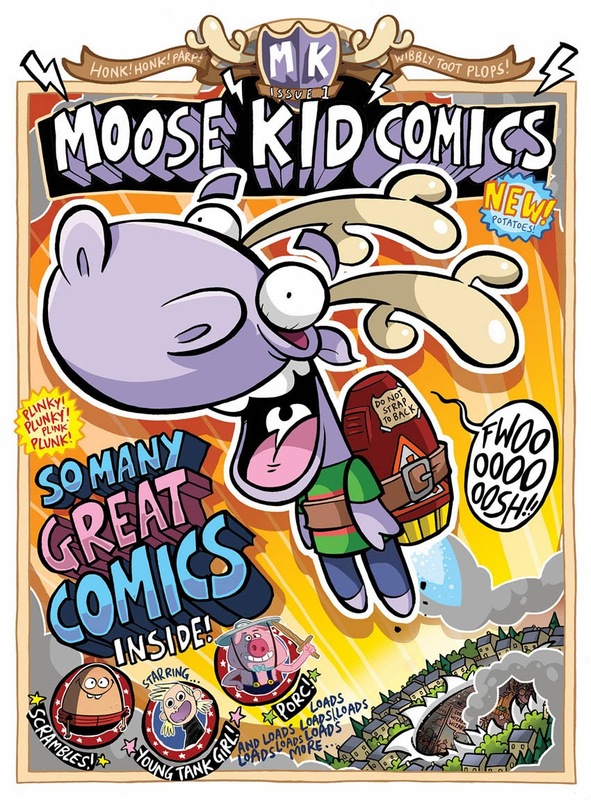 Moose Kid Comics – available from www.moosekidcomics.com – is a glorious 36-page, free to read, digital children’s comic featuring nearly 40 of the best comic creators working today, from well-established heroes to newer talents from the indie and web scenes. The showcase, which the team hope will attract the attention of a partner publisher, includes Young Tank Girl, an all-ages incarnation of the world-famous comic character. 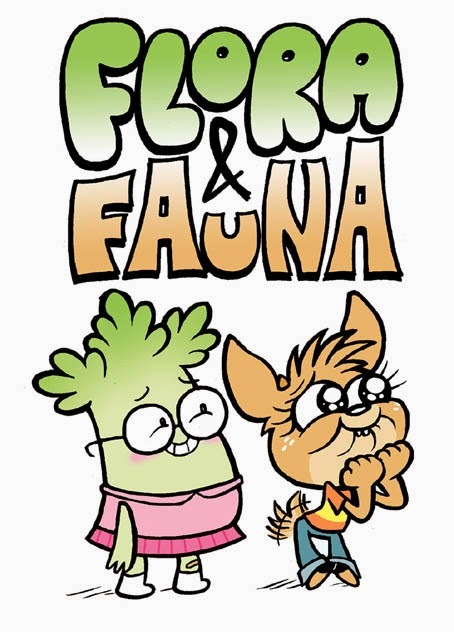 Each creator is contributing their own entirely original characters exclusively for the comic. 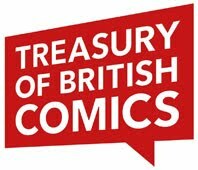 The title is the brainchild of top comic creator Jamie Smart, best known for his work on mainstream comics such as The Beano, Dandy and The Phoenix, who has long decried the parlous state of British comics. 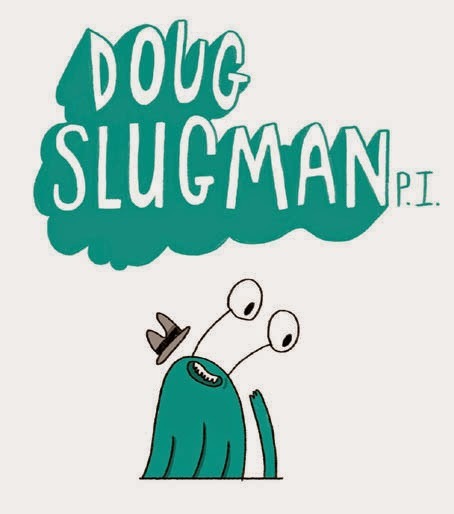 Together with the team he quickly gathered, he aims to restore some vitality to the genre made famous by weekly British comics like The Beano, Whizzer and Chips and Oink!, whilst combining it all with the modern sensibilities of Adventure Time and Moshi Monsters. “We created Moose Kid Comics for several reasons,” Jamie explains. “Firstly, to entertain comic readers and win new audiences. 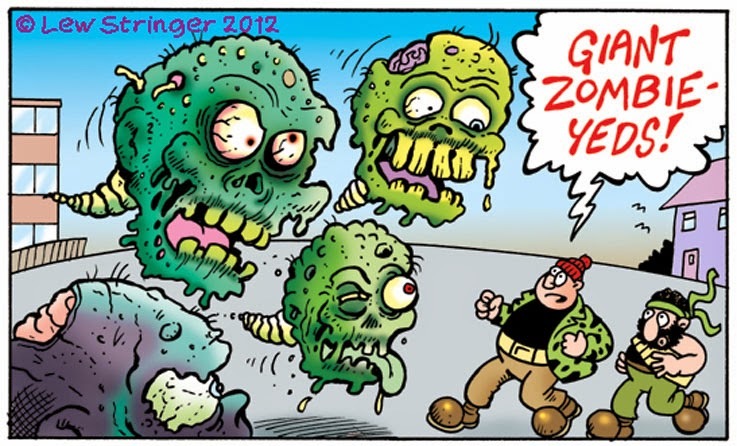 Secondly, to show how fantastic a children’s comic can be when artists come together and create the content themselves. 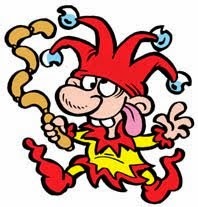 The creative team are well aware that in the UK, mainstream children’s comics have been struggling over the years, especially ones featuring original content. In early 2013 Jamie put out a call for artists to join the Moose Kid Comics project. To his astonishment, over 400 artists responded. The result is Moose Kid Comics and it’s available now as a digital comic, worldwide, via www.moosekidcomics.com. “I’m incredibly proud of what we’ve achieved and who is involved,” Jamie enthuses. 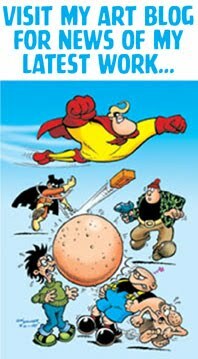 ”We have exclusive comics from artists like Tom Paterson, Mike Pearce and David Leach, heroes to anyone who grew up reading comics in the UK. And there’s Gary Northfield, Laura Howell, Mark Stafford, Roger Langridge, to name but a few, mixed in amongst newer artists like Rachel Smith, Tom Plant and Will Kirkby. “And, of course, we’re very excited to be showcasing a real exclusive – Young Tank Girl, by Alan Martin and Warwick Johnson-Cadwell themselves! While Moose Kid Comics is an enormous project in itself, the creative team behind it are hoping that its success will lead to greater things. “Moose Kids Comics is a statement,” says Jamie. “It’s a declaration of what we can do. It’s concrete proof of the high quality entertainment we can create, and the heart and passion of all the talented artists who want to help change children’s comics for the better. 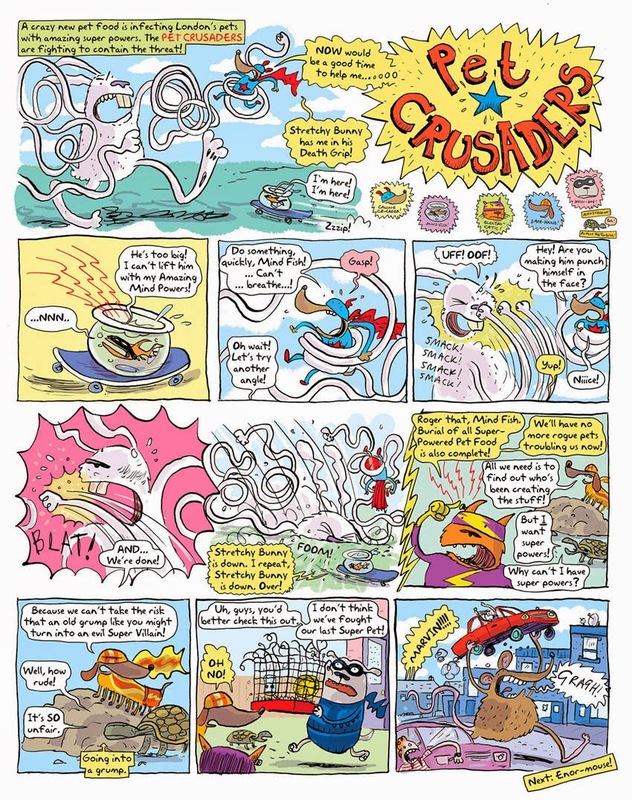 While this special free edition of Moose Kid Comics is a single issue for now, a one-off, whatever happens, the enthusiastic creative team are keen to find a way to make future issues, and keep this conversation going. Neill Cameron, Abby Ryder, Tom Plant, Andreas Schuster, Jess Bradley, Sarah McIntyre, Mark Stafford, Gary Northfield, William Tallman, Aaron Alexovich, James Downing, Aaron Blecha, Steve Tillotson, Hamish Steele, Chris Garbutt, Dan Gaynor, Rick Eades, Mike Pearse, Viviane Schwarz, Laura Howell, Alan Martin, Warwick Johnson-Cadwell, Lindsey Lea, Stephen Waller, Samantha Davies, Alan Ryan, Afonso Ferreira, Rachael Smith, Nigel Auchterlounie, Andrew Waugh, Joe List, Tom Paterson, Rikke Asbjorn, Roger Langridge, Vincent Woodcock, Will Kirkby, Wilbur Dawbarn, David Leach, Jamie Smart. Sounds good, looks bright and lively! 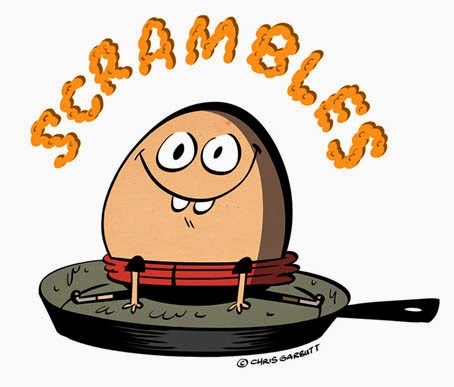 Many of us working in the comics industry wish there were more humour titles out there so I have to respect Jamie for making the effort to try and improve things. Let's hope that Moose Kid Comics can build from this digital one-off issue and attract the success it deserves. Just a reminder that for those of you wishing there was a new British adventure comic anthology out, - there is! The entire first volume of Aces Weekly is available to buy for the iPad via Comixology. Over 200 pages for just £6.99! What's in it? 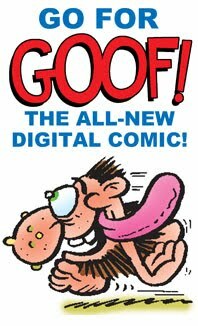 Tons of all-new and exclusive strips by David Lloyd, John McCrea, Carl Critchlow, Phil Elliott, Esteban Hernandez, David Jackson, Mychalio Kazybrid, David Leach, myself and many more! 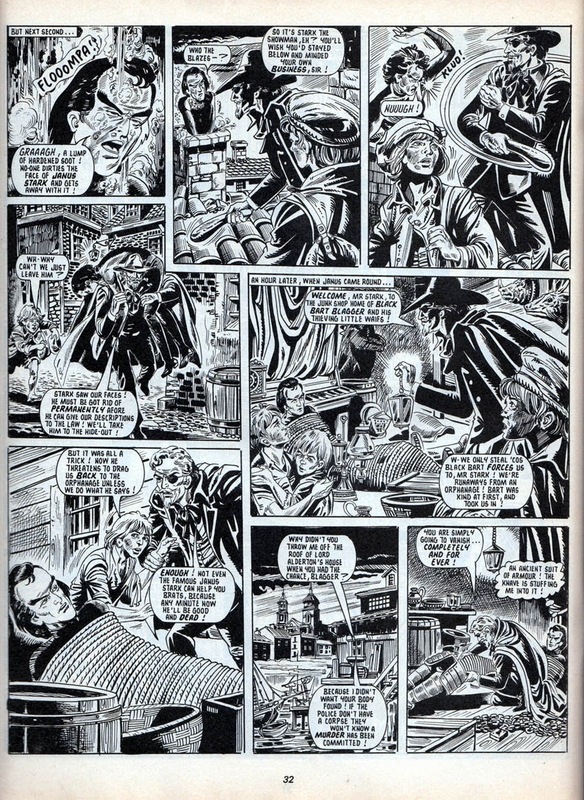 Aces Weekly isn't published by a profit-hungry corporation, but by someone whose name you should recognize, David Lloyd (artist of V for Vendetta, creator of Kickback) whose passion for keeping the project going is something we all appreciate. Those of us working for Aces don't receive a page rate as we do when we work for big publishers, but we get an equal share of the profits, so when you buy the comic you're not supporting some megabucks corporation, you're supporting the artists and writers. Every purchase helps, even if it only brings in a few quid. I know many of you would prefer Aces Weekly in print, but the expense of doing that isn't feasible, so digital is the way it is. So if you do have an iPad, give Aces Weekly a try. Hopefully you'll enjoy it as much as we did producing our strips, - which is a lot! 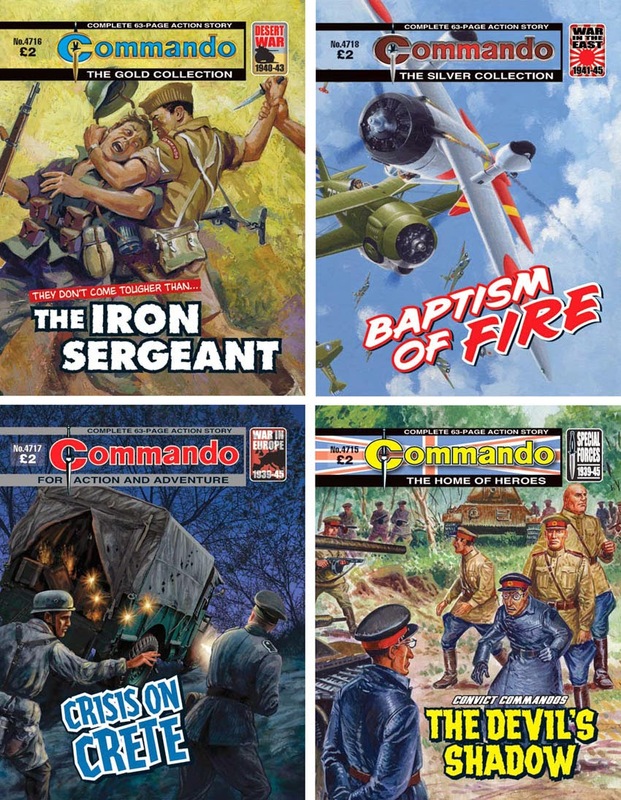 Thanks to the Commando offices for the images and info! Without peering into a mirror, it's not often you find yourself looking at your double, but that's what the quivering Jelly Jakes of the Convict Commandos was doing. He didn't like it one bit, especially as the man facing him was backed with four T34 tanks and about 20 heavily-armed Soviet infantrymen. When a task was “impossible” — a mission so dangerous that it looked like certain death — the army sent for Trouble Squad. And the man who led this bunch of hard cases was the toughest of them all — Sergeant “Rocky” Flint. He’d trained them, forged them into fighting machines who could force-march twenty miles in three hours, go three days in the desert on a cup of water, and then take on a force of Germans outnumbering them by three to one and smash them to a pulp! They didn’t call Flint “The Iron Sergeant” for nothing! 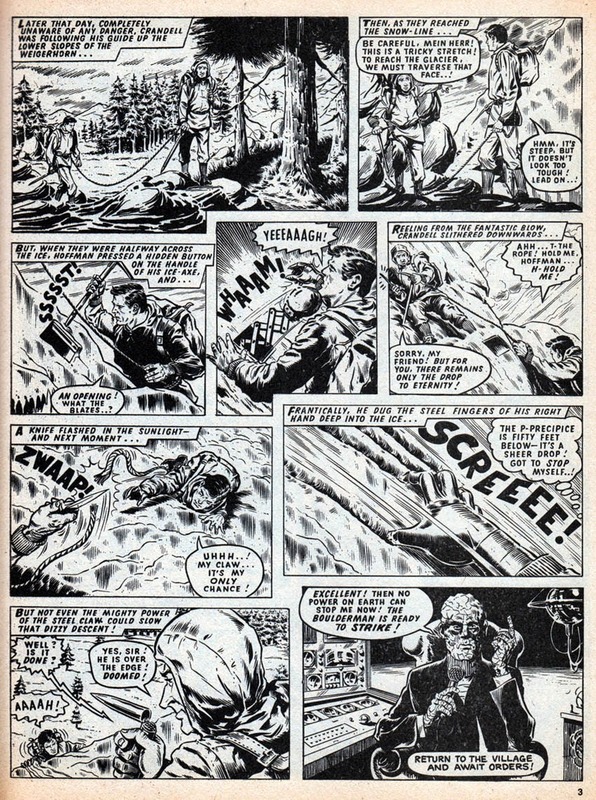 Victor De La Fuente, from whose flowing pen this story’s illustrations come, was undoubtedly on of war comics’ star turns. 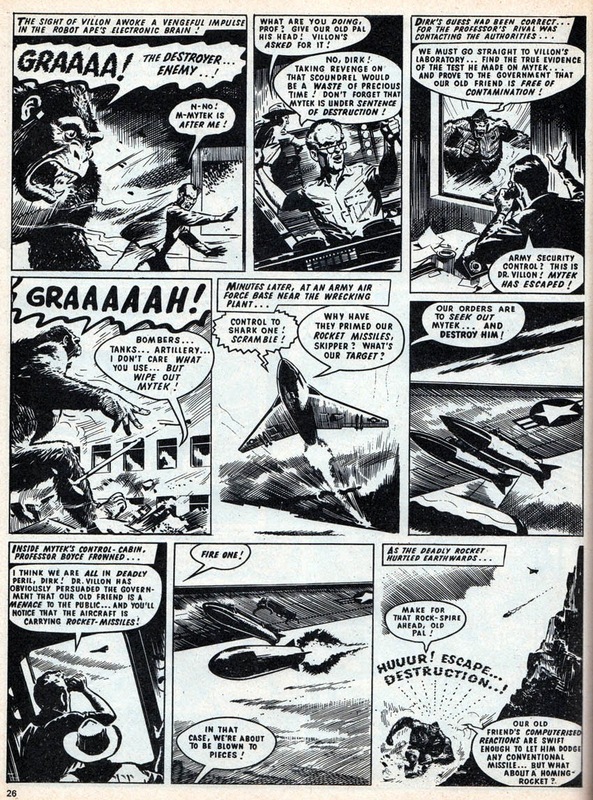 This is his first Commando story and it’s a cracker. His style is still developing but all the trademark movement is there. As is the magnificent figure and face work that would become his stock-in trade. 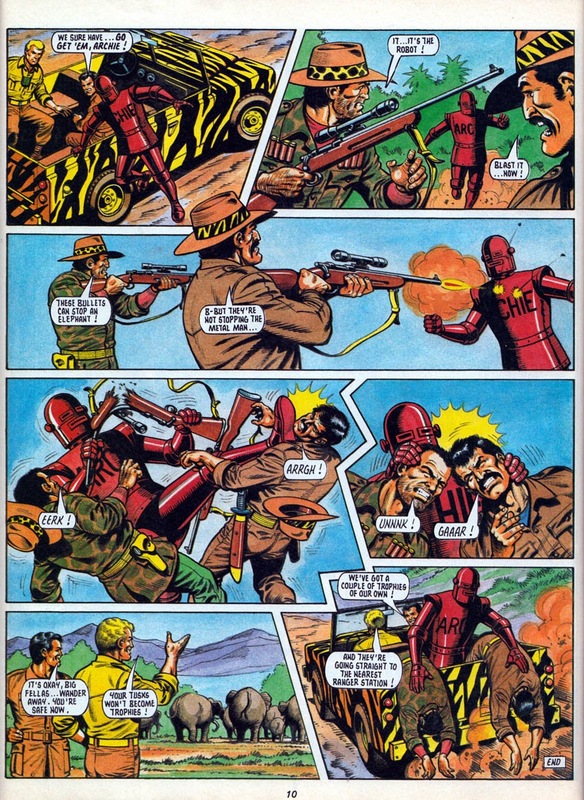 Victor illustrated almost 50 Commandos between 1964 and 1972 (his brothers also drew for us) and they are rightly held in high regard. The no-holds-barred script by Parsons is just as mighty and that cover! Wow! The restraining hand is almost lost in the blur of action. A really well crafted tale all round. Private Dan Vaughn was a bit of a layabout. He didn’t particularly like soldiering and his mate, Private Ian Hicks, was constantly nagging at him to make an effort. On Crete in 1941, they had a simple task, to transport some ammo in a Bedford truck. But —after an encounter with a low-flying enemy glider — Dan found himself in the middle of a battle, one involving Cretan partisans, crack German paratroopers and the SS. Lying about was no longer an option if Dan wanted to stay alive! As boys they had hated the sight of each other, and now they were rivals to command the same RAF fighter squadron. One was a regular officer who knew all the right people…the other was an “upstart”, but he had been blooded against an enemy who gave no quarter. Either one might end up in charge, but what neither could forget was that in war all the peace-time rules go out the window…survival becomes the name of the game. Foremost, a Commando should be a good (fictional) read. However, it’s a welcome bonus when readers tell us that they learned something too. For example, Ian Kennedy’s stunning cover features a Curtiss Hawk aircraft flying in the colours of the Chinese Air Force. Our British hero serves in an International Squadron, and he’s hot on the tail of a Japanese Claude fighter. Although the story is imagined, it has an air of historical and military authenticity which we also certainly strive for…but not at the expense of a good yarn. 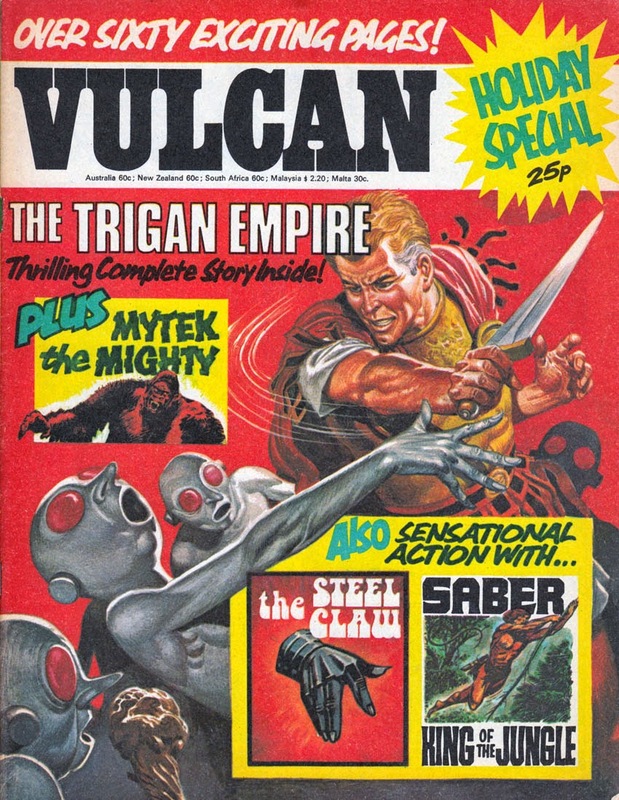 As noted in the previous blog post about Vulcan weekly, it only had a relatively short run (30 issues in Scotland, then 28 nationwide). 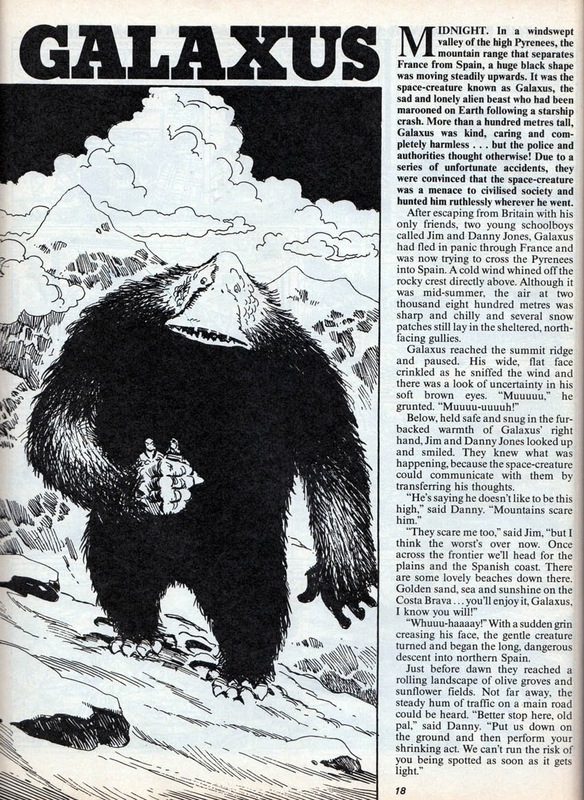 However, after its demise, IPC still felt confident enough to publish a Vulcan Holiday Special in the summer of 1976. The thing that's immediately evident is that the design and layout of the Holiday Special is a big improvement on the weekly. It's highly likely it was packaged by a different art editor. I would venture that if the weekly had looked as dynamic and exciting as this it might have lasted a bit longer. THE STEEL CLAW. Artist: early Belardinelli perhaps? 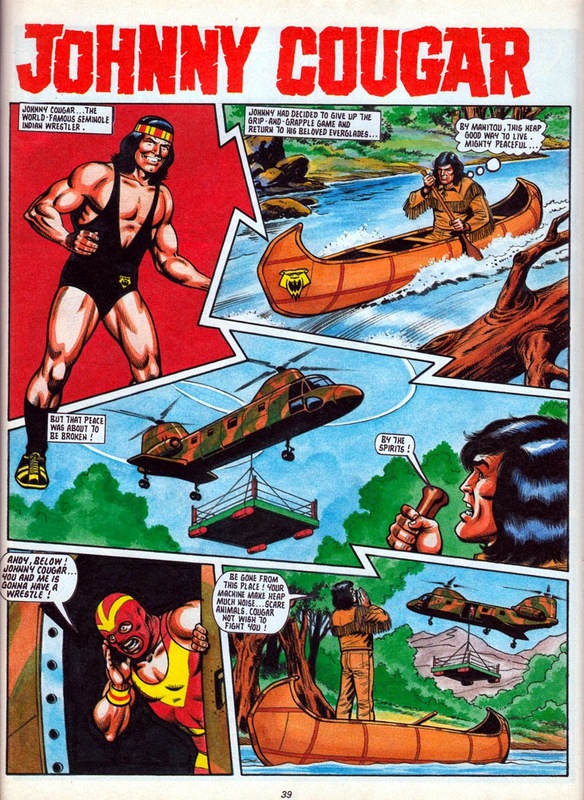 Inside, the Special reprints stories of The Steel Claw, The House of Dolmann, Mytek the Mighty, Robot Archie, and Saber: King of the Jungle. 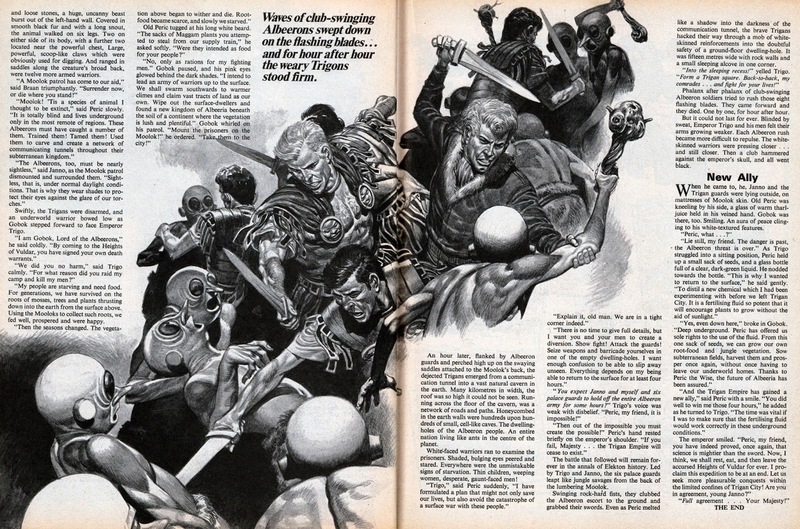 All are edited versions to one degree or another of serials from Valiant, Lion, and Tiger, but again the design and any resizing is a step up on that which we'd seen in Vulcan weekly. MYTEK THE MIGHTY Artist: Bill Lacey. 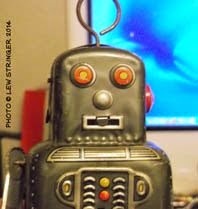 ROBOT ARCHIE Artist: Ted Kearon. 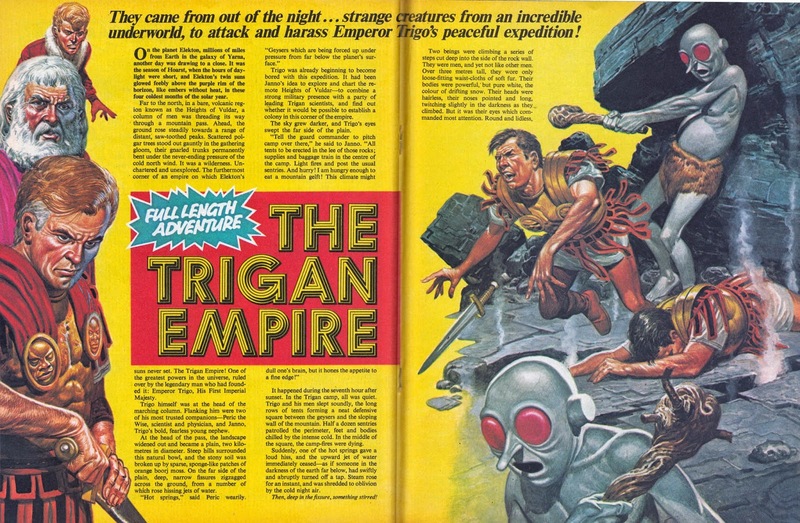 The highlight of the issue is a brand new six page Trigan Empire prose story, accompanied by new artwork by Don Lawrence (who also illustrated the cover). Click to enlarge.. There's also a couple of Sporty humour strips by Reg Wooton. These would have originally appeared in either Knockout or Valiant. All in all, this one-and-only Vulcan Holiday Special is a great read and worth tracking down on eBay or wherever. Admittedly the Steel Claw story they chose to reprint isn't one of the best, and isn't by Jesus Blasco the regular artist, but the rest of the comic is good stuff. 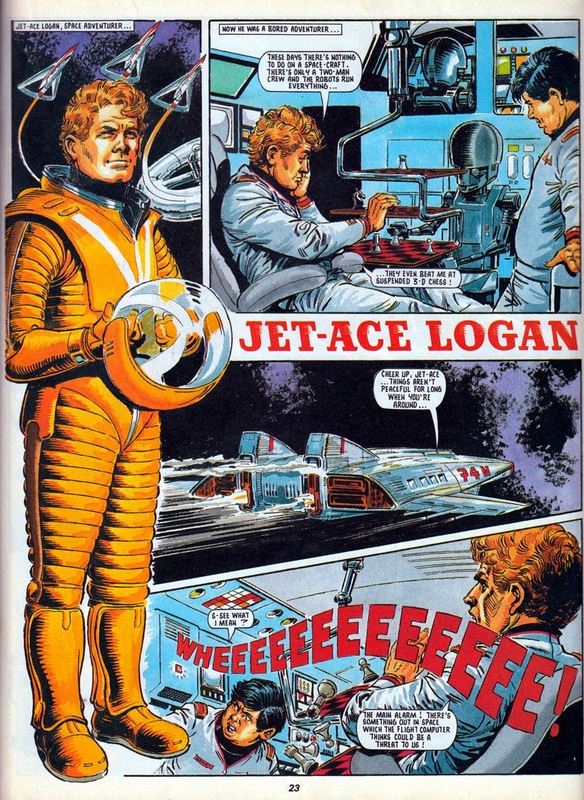 There was also a one-off Vulcan Annual published that year and I'll take a look at that another time.